Transportation is a vital part of economy as any problem in transportation disrupts the entire business channel. This is why, any petrol price change has a far-reaching effect in disruption of business. We have already covered transport by rail & air. In this article, we will discuss the goods transportation and GTA (goods transport agencies) and the provisions of GST applicable on them. What service of transportation of goods is exempt under GST? What are the services provided by a GTA? What was the situation under Service Tax? What is the rate of GST on GTA? Is a GTA liable to register? Who pays GST while hiring a GTA? Which businesses are liable to pay GST under reverse charge for a GTA? Who will pay under Reverse Charge? The most popular form of goods transport in India is via road. As per the National Highways Authority of India, about 65% of freight and 80% passenger traffic is carried by the roads. Transportation of goods by road are done by transporter or courier agency. This article will discuss the transporter, i.e, the GTA. Therefore, the service of transportation of goods by road continue to be exempt even under the GST regime. GST is applicable only on goods transport agency, GTA. As per Notification No. 11/2017-Central Tax (Rate) dated 28th June, 2017, “goods transport agency” or GTA means any person who provides service in relation to transport of goods by road and issues consignment note, by whatever name called. This means, while others might also hire out vehicles for goods transportation, only those issuing a consignment note are considered as a GTA. 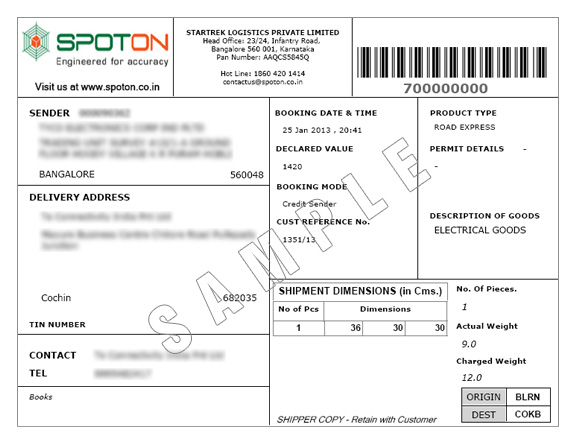 Thus, a consignment note is an essential condition to be considered as a GTA. A consignment note is a document issued by a goods transportation agency against the receipt of goods for the purpose of transporting the goods by road in a goods carriage. If a consignment note is not issued by the transporter, the service provider will not come within the ambit of goods transport agency. transferred to the transporter. Now the transporter is responsible for the goods till its safe delivery to the consignee. Person liable to pay GST – consignor, consignee, or the GTA. If these services are included and not provided as independent activities, then they are also covered under GTA. RCM applied under Service tax. There was an abatement of 60% (40% taxable) for transportation of used household goods and 70% (30% taxable) for transportation of normal goods. ** On 31st Dec 2018, The Government cancelled Notification No. 32/2017- Central Tax (Rate) dated 13th October, 2017, thereby making purchase from unregistered dealers taxable. However, list of registered persons or transactions is yet to be notifed. There was a lot of confusions whether a GTA has to register under GST. As per Notification No. 5/2017- Central Tax dated 19/06/2017, a person who is engaged in making only supplies of taxable goods/services on which reverse charge applies is exempted from obtaining registration under GST. 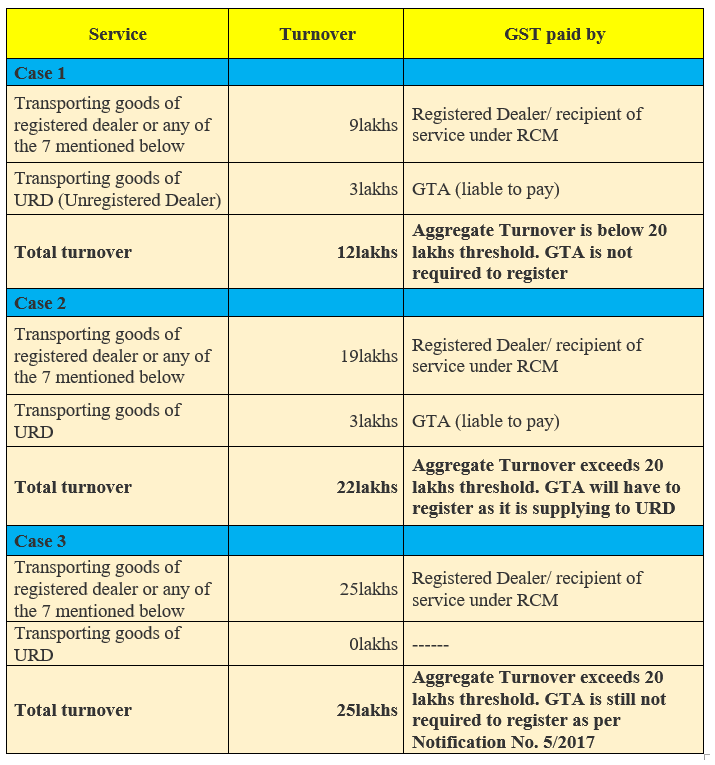 Thus, a GTA does not have to register under GST if he is exclusively transporting goods where the total tax is required to be paid by the recipient under reverse charge basis (even if the turnover exceeds 20 lakhs). If a GTA provides the services to the certain businesses, recipient of services is required to pay GST under reverse charge. As per Notification No. 13/2017- Central Tax dated 28/06/2017 the person who pays or is liable to pay freight for the transportation of goods by road in goods carriage, located in the taxable territory shall be treated as the receiver of service. If the supplier of goods (consignor) pays the GTA, then the sender will be treated as the recipient. If he belongs to the category of persons above then he will pay GST on reverse charge basis. If the liability of freight payment lies with the receiver (Consignee), then the receiver of goods will be treated as a receiver of transportation services. If he belongs to any of the above category of persons, then he will pay GST on reverse charge basis. (Whether or not registered under GST) Company B Ltd.
** GTA services to an unregistered person is exempted as per Notification No. 32/2017- Central Tax (Rate) dated 13th October 2017. However, this notification is cancelled as of 31st Dec 2018 and hence, tax must be paid under RCM for unregistered purchases on the notified list of supplies. However, the list is yet to be notified. As per Notification No.32/2017-Central Tax (Rate) dated 28th June 2017, intra-state supplies of services or both received by a registered person from any unregistered supplier, was exempted from GST if it does not exceed Rs. 5,000 in a day. However, the Government has cancelled the notification and hence, RCM applies on unregistered purchases for only specified list of supplies, which is yet to be notified. However, the GTA has to opt at the beginning of financial year. Service receiver can always avail ITC on GST paid under RCM. A GTA cannot enjoy any ITC on any of the inputs. So, payment of tax will be only through cash in the normal modes of card/netbanking/cash (only for taxes upto Rs.10,000). If all the services of the GTA fall under RCM then a GTA is not required to register. If a GTA registers, then it will have to file the normal 3 monthly returns – GSTR-1 (sales), GSTR-2 (purchases-no ITC available) & GSTR-3 (monthly summary & tax liability). (b) a person other than a registered person, shall be the location at which such goods are handed over for their transportation. Rajesh is a registered dealer in Bangalore. He hires a GTA to deliver goods to Mumbai. Place of supply will be Bangalore. Anita is unregistered dealer in Gujarat who hires a GTA to deliver goods to Rajasthan. Place of supply will be Gujarat where Anita hands over the goods to the transporter. Vikas is registered in both Mumbai and Bangalore. He hires a transporter (based in Mumbai) to deliver from Bangalore to Delhi. CGST & SGST will be applicable. If the transporter is based in Chennai, then IGST will be applicable. Ajay hired a GTA to transport his goods. The consideration charged was Rs. 1,200. Will Ajay pay GST? Ajay will not pay GST under RCM as the consideration for transportation of goods on a consignment transported in a single carriage is less than Rs. 1,500. Vinod hired a GTA to transport goods. The GTA was asked to come 2 days as Vinod would receive the goods in batches. The entire consideration was Rs. 600. Will Vinod pay GST? Vinod will not pay GST because the consideration charged for transportation of all such goods for a single consignee does not exceed Rs. 750. Mr. Ajay, a working professional, is moving houses and hires XYZ GTA to transport his household items. XYZ demands Ajay to pay GST under RCM as moving charges are Rs. 6,000. Ajay is confused. Ans: Ajay is unregistered and if XYZ GTA is also unregistered under GST then, GST is not applicable. If XYZ is registered, then it will pay GST of 5%. RCM will not apply on Ajay. Anand, a garments shop owner in Kolkata, hires a truck to deliver goods from wholesaler to his (Anand’s) shop. Anand’s turnover is less than 20 lakhs and he has not registered under GST. The GTA demands that Anand should pay tax under RCM. Anand argues that since he is not registered, he does not have to pay any GST. Ans: Only the persons above (Notification No. 13/2017- Central Tax (Rate) dated 28th June, 2017) are required to pay GST under RCM. Unregistered dealers (Anand) purchasing goods/services from unregistered GTA do not have to pay GST under reverse charge mechanism. If the URD hires from a registered GTA, then the registered GTA is liable to pay GST. So, Anand is not liable to pay GST under RCM. Anand now purchases garments from Assam and pays for a truck to deliver the goods to his shop in Kolkata. The GTA says that Anand has to register for GST as he is making an inter-state purchase as only registered dealers can have inter-state trade. Ans: An unregistered person can make inter-state purchases. For making inter-state sales, he will have to be compulsorily registered. Since, Anand is an unregistered dealer and the GTA is also unregistered then the concept of RCM does not arise. The GTA is registered at Assam and its branch is collecting cash in Kolkata on his behalf. Recipient of service Anand is in Kolkata. If Anand was registered, would he have charged IGST or SGST/CGST under RCM? If the original transporter in Assam bills Anand, then IGST should be charged. If he bills the branch then SGST/CGST will apply. Anand has received a one-time contract to sell garments to a dealer in Mumbai. Anand hires a truck to send the goods. Since, Anand is not registered under GST, he cannot make any inter-state sale. To make an inter-state sale, he must register as a casual taxable person. Then when he hires a truck to send the garments, automatically he is liable to pay GST under RCM. Anand is sick of all this and decides to voluntarily register. He hires a truck again to transfer goods from the wholesaler to his shop. GTA asks him to pay GST on RCM as he is registered. But Anand’s view is that his turnover is still below 20 lakhs. Ans: The threshold of turnover does not matter if a person is voluntarily registered. All provisions of GST Act will apply to a registered person. Anand is liable to pay GST under RCM. Anand’s turnover has increased to 45 lakhs. He wants to shift to composition scheme as he sells mainly to end consumers. But he is worried as his GTA has told him they would not deliver his goods if he is registered under composition scheme as the GTA become liable for GST. Ans: This is a myth. Even composition dealers are liable to pay GST under RCM. Anand will pay GST on RCM if he hires a GTA whether he is registered as a composition dealer or as a normal dealer. The concept of RCM on GTA was also there under service tax. Pure transportation of goods services is mostly provided by unorganized sector and hence they have been specifically excluded from the tax net. In respect of GTA, the liability to pay GST falls on the recipients under reverse charge in most of the cases. However, the GTA may opt to pay under forward charge. However, transporters were confused in the beginning due to the law “persons who are required to pay tax under reverse charge” have to be compulsorily registered. Transporters refused unregistered dealers because they were afraid they would have to register. The government issued more clarifications & FAQs addressing the GTAs on this, to reduce such confusions. Are you a GTA? Are you confused about whether you are liable to register today? Talk to an expert today. we also have ClearTax Bill Book to help you to issue GST compliant tax invoices or bill of supply as the case maybe. 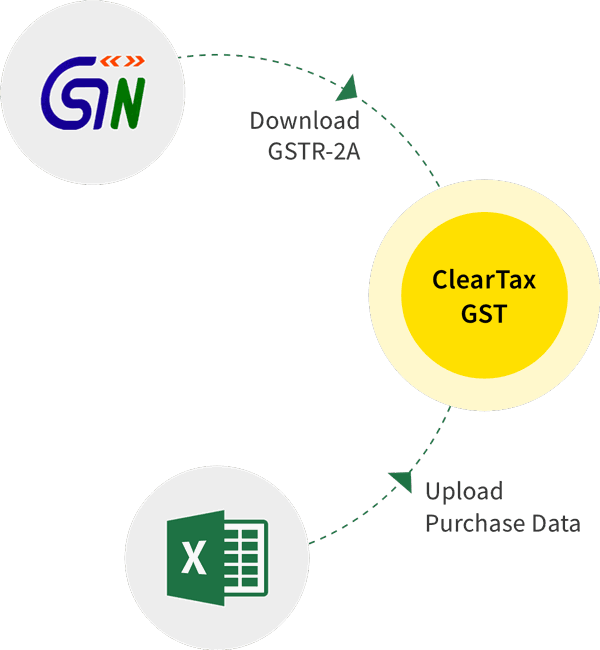 GST Invoicing made easy with ClearTax GST Offline Utility. Click here to get the ‘Offline GST Template’ and ‘How to Use’ Guide for FREE.